Students work with a partner; each student has a map of the city with half of the streets and half of the places labeled. Students converse in the target language to complete their maps. 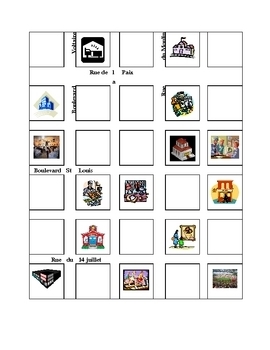 Street names are in French, but may easily be changed for any other language; the rest of the activity has pictures only. Places included are: beach, hospital, airport, supermarket, café, fire station, jewelry store, bank, gas station, pharmacy, church, library, theater, movie theater, swimming pool, hotel, train station, apartment building, travel agency, restaurant, town hall, police station, bakery, butcher shop, post office, school museum, mall, gym, stadium.